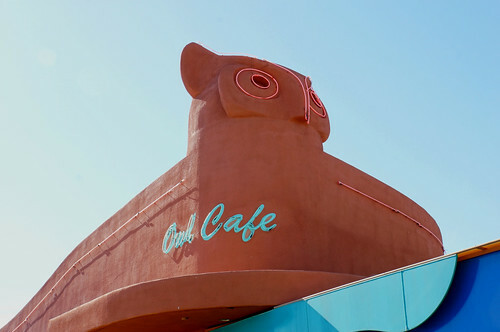 We decided to try having breakfast at a place recommended by a coworker of mine – not on 66, but very cool, The Owl Cafe has a very cool structure! Afterward, we drove down to Central Avenue (Route 66) to take a few photos of some of the excellent signage still remaining. I only took a fraction of what was there – I would like to spend much more time in Albuquerque, and especially in the evening! The evening before, we had arrived late and we were all pretty tired and anxious to get to our motel. Without a 3 year old with us, I would have been cruising Central Avenue for neon shots, but the little man was in need of sleep (even though he was still really hyped up! ); he didn’t nap, slept minimally and was really excited on our trip – too excited, actually. He hated leaving every place we went that he enjoyed, so there were some difficult moments. In addition to driving on 66, today would be a “filming location” day! 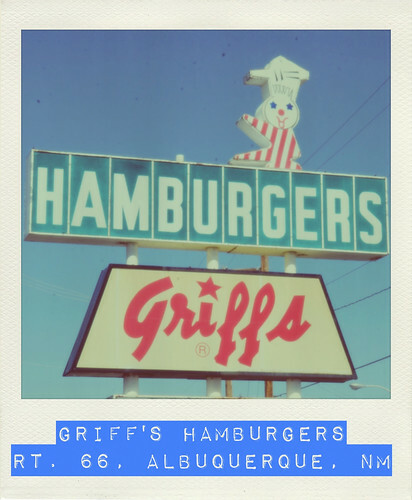 It’s been a while since we have done a filming locations post (our last were in 2011, we did all of “Mystic Pizza” and also filled in more of “Ferris Bueller’s Day Off“). 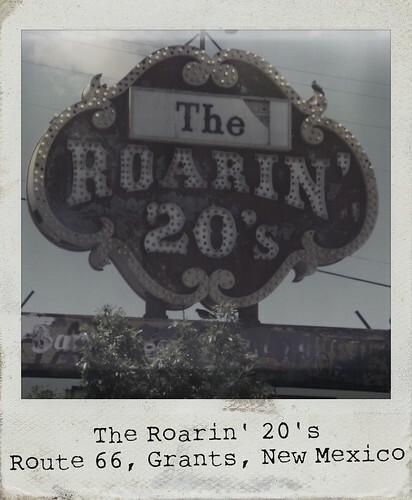 We would be focusing a bit of attention in Albuquerque to photograph movie locations from the 2007 comedy “Wild Hogs,” starring John Travolta, Tim Allen, Martin Lawrence, and William H. Macy. 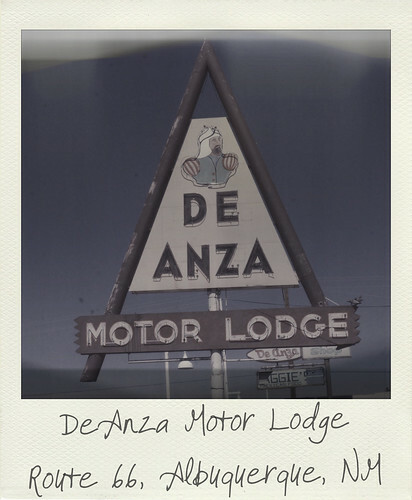 That blog post is linked here and lists the locations (also can be seen on our trip map above). After finishing all of the filming locations, we continued west on Central Avenue, which is the post-1937 alignment of Route 66 in this area. We continued up Nine Mile Hill, which offers a beautiful views from the top; eastbound, you will get a great view of Albuquerque. 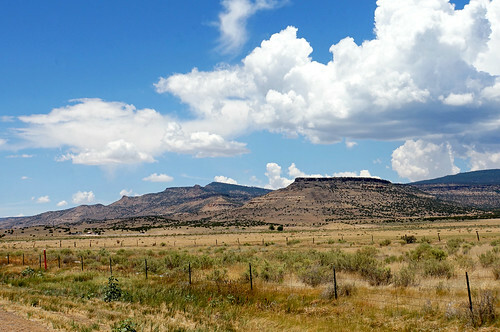 Westbound, is a nice view of the New Mexico prairie. 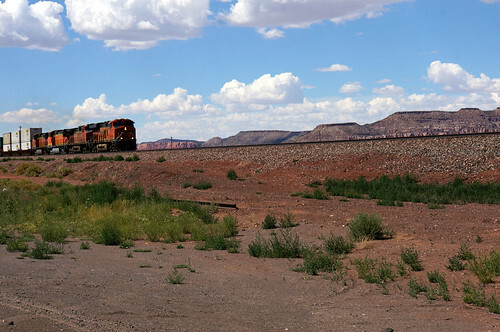 By coincidence, on our honeymoon in 2002, I snapped a photo of the westbound view and as I was watching the 1940 film, “The Grapes of Wrath,” realized that once scene in the film was shot at the same location from my honeymoon photo! 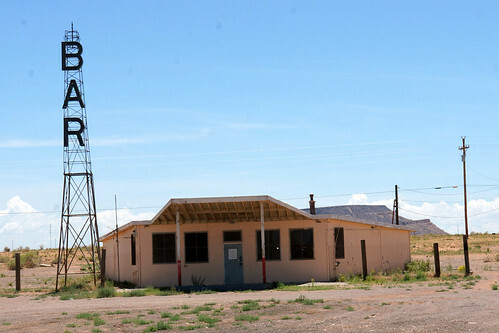 Check it out on my “Grapes of Wrath – Filming Locations” page. 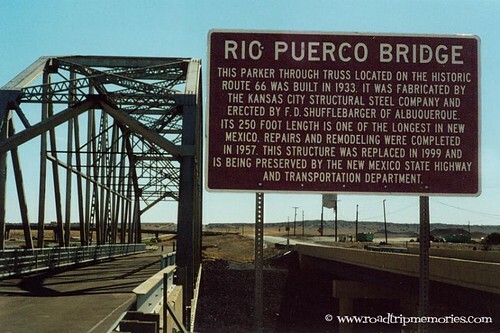 Continuing westbound on the post-1937 alignment, approximately 19 miles west of Albuquerque is this Parker through truss bridge crossing the Rio Puerco. 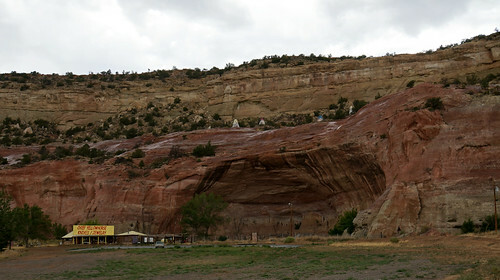 Here is the same location back in June 2002. 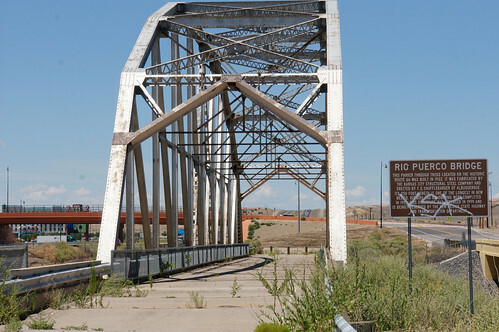 Shortly after (September 2003), a large casino called the Route 66 Casino opened up, and is now visible to the left of the bridge in the background. Was far more desolate before! Opening the photos on Flickr, will offer a larger view. At this point, it is necessary to join the Interstate, which we did until Exit 126, where the pre- and post-1937 alignments converge. However, there’s a small portion of the pre-1937 alignment that continues west through Laguna Pueblo land, so we thought we’d try it. According to McJerry’s EZ 66 Guide, this portion is fairly rough (it was), so we didn’t take it after all. We did spot this bar out there on this alignment. 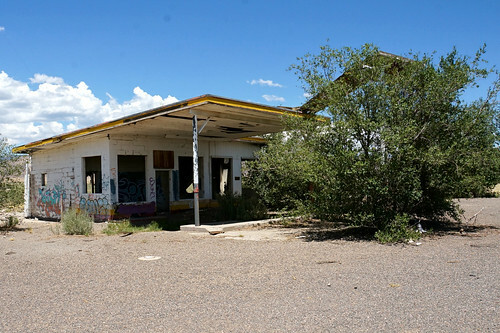 Instead, we went back up to to the post-1937 alignment which still follows I-40, at this point, until Exit 117 at Mesita, where we exited and continued on Route 66 through Laguna Pueblo. 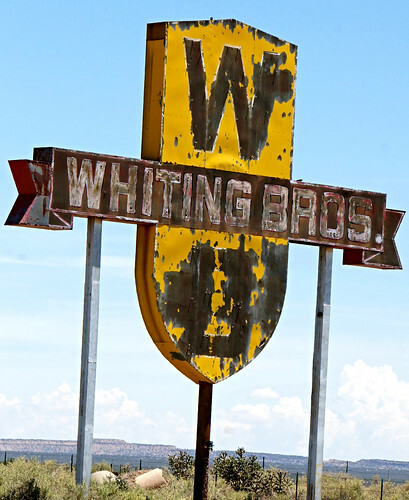 Between San Fidel and McCarty’s, there’s an old Whiting Bros. station in ruins. 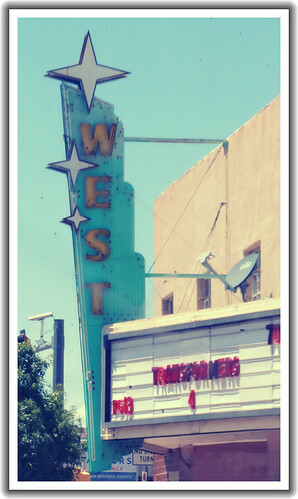 Would be nice to see it restored and in use like the one in Moriarty some day. 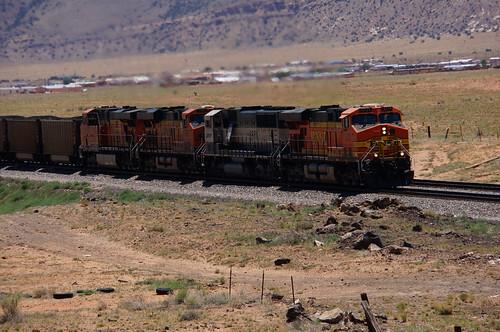 There are also such beautiful views in New Mexico too! 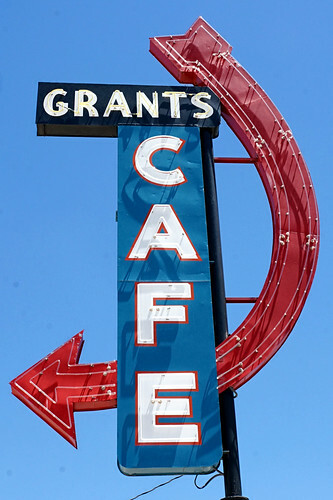 Next, we arrived in Grants, which has some neat old signage – I didn’t get them all, here are just a few. Grants was also a playground stop for our grandson, who is very adept at spotting playgrounds! There was a nice park along Route 66 with play equipment, so we made a stop. 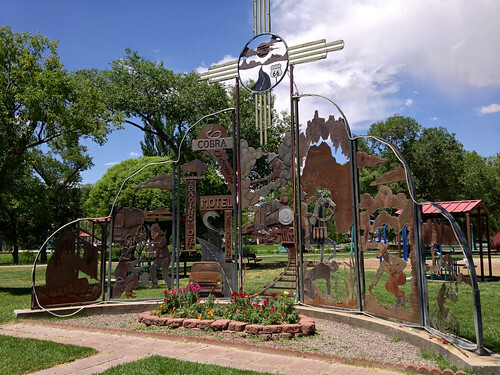 Along the road in front of the park is a nice metal sculpture commemorating the City of Grants and its history, including Route 66, Native American culture, uranium mining, pioneers, and more. Very detailed! You can click on the photo below to go to my Flickr site, where you can view a larger size for more detailed viewing. 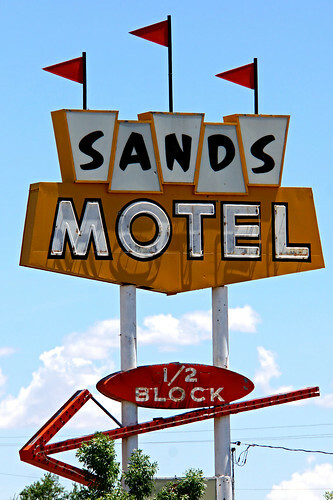 Continuing west on Route 66 from Grants, we saw this old motel sign near Bluewater. 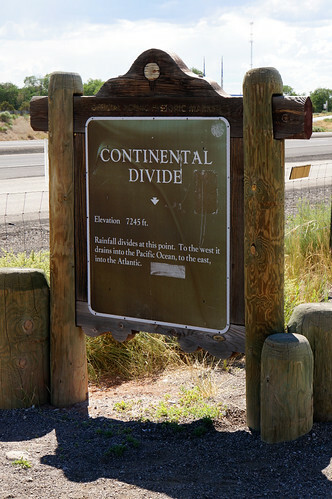 Then there’s the Continental Divide, elevation is 7,245 ft. at this location. Rainfall divides at this point; to the east, it drains to Atlantic and to the west, the Pacific. Most of our time in Gallup was spent at Bubany Park, a tiny residential neighborhood park with…you guessed it…a playground. I’m starting to think of this trip as the “Playground Trail.” LOL Of course, the Playground Trail is more commonly known as the National Park to Park Highway, a loop that connected National Parks. But on this trip, it was about us visiting playgrounds! 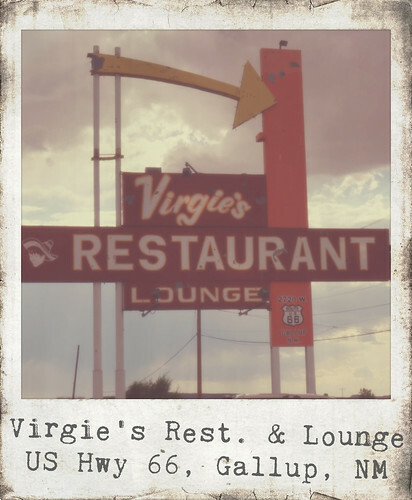 I did snap one photo on the west side of Gallup, though, of a place called Virgie’s Restaurant and Lounge. We continued on and decided to stay in Holbrook. Though we had gained another hour, our bodies didn’t feel it and we were very tired and hungry. 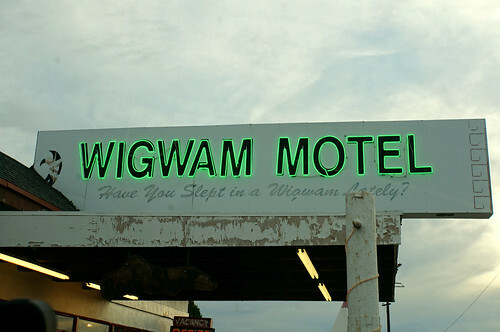 We stopped at the Wigwam Motel, but they were full (sad face). We didn’t make a reservation simply because we typically travel without a strict plan. I like to have all of my travel information (routes, points of interest, etc.) all meticulously gathered and organized for our trips using Trimble, where I create a digital guide map that syncs to my iPhone. When we travel, I use the guide for reference, but we like to just drive and only generally concern ourselves with where we’ll end up for the night, not adhere to strict schedules. 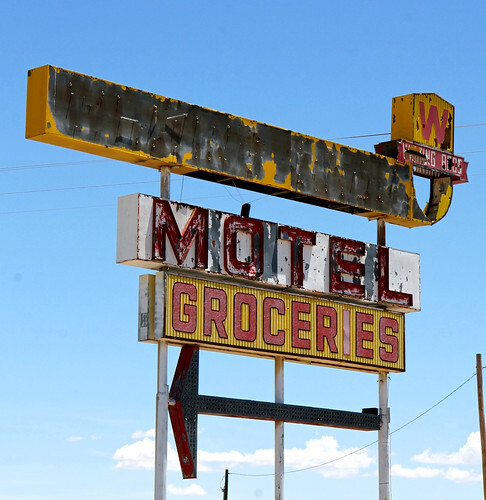 Sometimes we do struggle to find acceptable lodging, but it’s always fun and mildly adventurous! Anyway, we ended up at a hotel right by the Wigwam called the Magnuson, and stayed in a perfectly acceptable and comfortable, albeit nondescript room. Below is a slideshow of all of the photos from this portion of the trip.